If you want to clean cancer’s clock—that is, defeat it decisively—you may want to really clean it—that is, restore it to proper working order. Only cancer cells that remain active, in sympathy with the tick-tock of their internal circadian mechanisms, remain susceptible to cancer therapies. So, how might these circadian mechanisms be kept in motion? One possibility, suggests a Ludwig Cancer Research study, involves sodium bicarbonate, the substance commonly known as baking soda. Long celebrated for its many household uses, sodium bicarbonate now promises to awaken cancer cells that have gone to sleep deep inside tumors, where oxygen deprivation and acidic conditions go hand in hand. By buffering against acidification, sodium bicarbonate rescues circadian oscillation. Acidification, the Ludwig researchers report, essentially disengages some of the elements that keep the cell’s circadian clock ticking. Specifically, the regulatory complex known as mTORC1 (mechanistic target of rapamycin complex 1) becomes separated from RHEB, a protein required for mTORC1’s activation. When these gears fail to mesh, mTORC1 remains dormant, suspending the synthesis of proteins—including the components of the cell’s molecular clock—along with most metabolic activity. This acid-mediated effect, the Ludwig researchers assert, can be reversed by sodium bicarbonate. When the researchers gave tumor-xenografted mice water that had been supplemented with sodium bicarbonate, the acidity of hypoxic patches in the tumors was neutralized. This reversal, the scientists say, was achieved by bringing mTOR1 and RHEB back into proximity with each other. 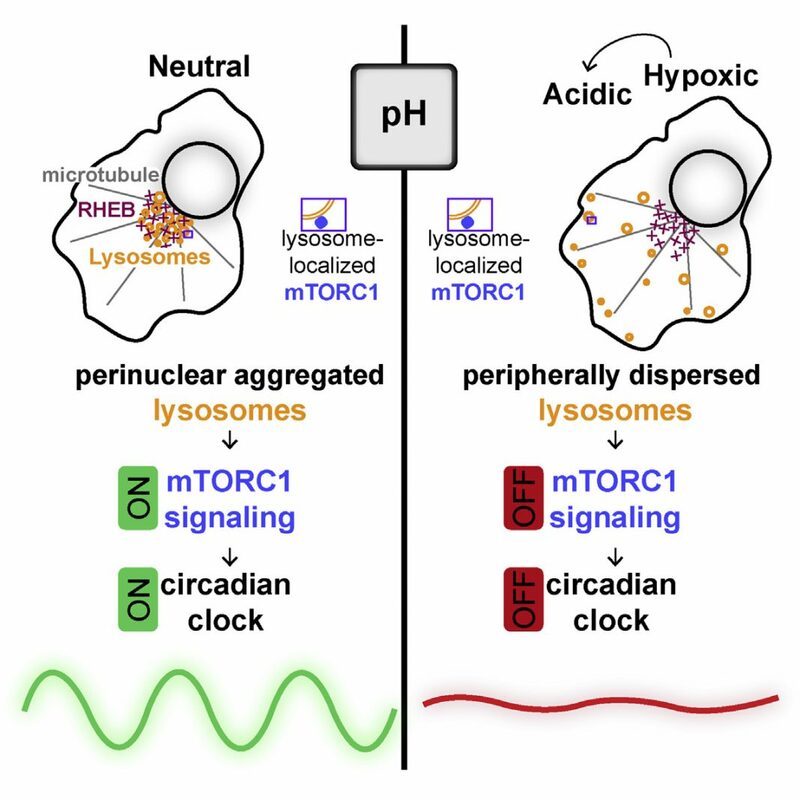 Details of mTOR1’s disengagement/reengagement with RHEB were presented May 31 in the journal Cell, in an article entitled “Acid Suspends the Circadian Clock in Hypoxia through Inhibition of mTOR.” According to this article, acidic conditions can redistribute mTORC1-containing lysosomes within cancer cells. The lysosomes, which travel along microtubules, are propelled by protein motors away from the area around the nucleus, where they’re ordinarily located, isolating them from perinuclear RHEB. The study’s authors, led by Chi Van Dang, M.D., Ph.D., scientific director of the Ludwig Institute for Cancer Research, conclude that acid produced during the cellular metabolic response to hypoxia suppresses the circadian clock through diminished translation of clock constituents. Baking soda had previously been reported to enhance cancer immunotherapy by one of the coauthors of the new study, Robert Gillies, Ph.D., of the H. Lee Moffitt Cancer Center, though the mechanism underlying the effect was unclear. In the current study, the Ludwig scientists emphasized the importance of the peripheral scattering of lysosomes in acidic conditions, an effect that has been observed in other studies, though not in the context of mTORC1 activation, which appears to be governed by the spatial positioning, or repositioning, of the mTORC1 signaling elements. These mechanistic details are relevant to the study of cancer because researchers have long known that quiescent cells cannot typically be killed by chemotherapy. Notably, Dang and his team also found that T-cell activation, which is essential to most immunotherapies, is similarly compromised under acidic conditions. “We started out with a question about oxygen starvation and the circadian clock, and we ended up discovering a new mechanism by which acidic conditions in tissues shut off a lot of things—including the cell’s molecular clock,” muses Dang. The finding that something as simple as baking soda could possibly help reverse this effect and render quiescent cancer cells susceptible to cancer therapies excites Dang. “The concept is so easy,” he says. “It’s not some $100,000 per year drug. It’s literally just baking soda.” Dang and his team are now looking into how acidity might affect immunotherapy and further exploring the acid-induced quiescence of cancer cells.